With countless unwelcome pumpkins to deal with, Rebecca Estelle turns disaster into a celebration. One day, years and years later, white-haired Rebecca was busy not eating pumpkins when--SPLAT--a giant pumpkin fell off an overloaded truck and smashed into her yard. She buried the mess so she wouldn't have to look at it, and, as you might imagine, she witnessed a bumper crop the following fall, "Too Many Pumpkins". Kindergarten-Grade 3-Golden autumn hues cast their warm glow throughout this humorous harvest tale. Rebecca Estelle, having survived on various pumpkin dishes during her poor childhood, hates them so much that when a pumpkin accidentally falls into her yard, she shovels dirt over it so she won't have to see or think about it again. In spite of all her efforts to the contrary, she is "rewarded" with a yard full of bright orange globes the following fall. Not willing to let the windfall go to waste, she once again prepares the dishes she detested as a child, carves jack-o-lanterns from the remaining pile, and then thoroughly enjoys the fellowship of her neighbors lured by the glow of the mischievous carvings. And, of course, Rebecca Estelle saves seeds for next year's planting. Lloyd snuggles White's text into her rich watercolor-and-pen illustrations. Nature's determined bounty spills from formal borders and is tinged with just the right touch of realism to contrast with the cartoonlike Rebecca Estelle and her feline companion. 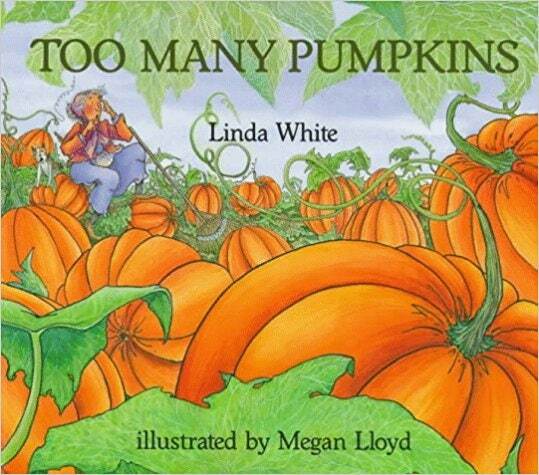 The vocabulary and sentence structure calls for solid independent readers, but the large horizontal format packed with engaging fun makes this title an ideal harvest/Halloween read-aloud.